The R&S®AM300 is a dual-channel Arbitrary/Function Waveform Generator that offers high functionality and spectral purity at a favourable price. 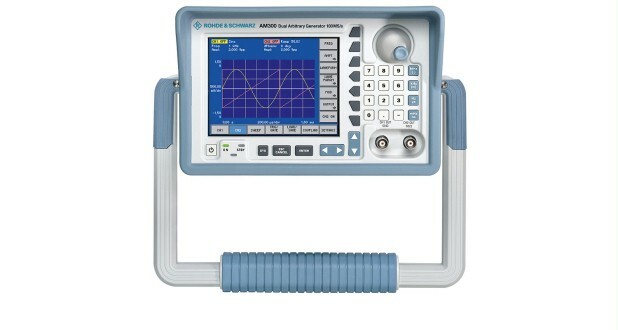 The R&S®AM300 is a dual-channel Arbitrary/Function Waveform Generator that offers high functionality and spectral purity at a favourable price. With its superior characteristics, the instrument reproduces the digitally generated signals almost distortion-free - even at high output levels and frequencies. The R&S®AM300 thus meets requirements of a reference source for a number of tasks. With a high sampling rate of up to 100 MSa/s, a 256K-point waveform memory per channel and the Waveform Composer software, almost any waveform can be realized - no matter whether for applications in the lab, production or service. The two channels of the instrument are precisely phase-coupled and thus allow the generation of analog I/Q signals with which, for example, the RF Signal Generator R&S®SM300 can be modulated. The upper frequency limit of 35 MHz for sine signals and 50 MHz for square signals provides enough scope for future tasks.